Freedom Scientific’s SARA (Scanning and Reading Appliance) is an affordable and easy-to-use solution for those with low vision or who are blind or deaf-blind. The SARA enables the reading of a wide variety of printed material including books, documents, mail, newspapers, magazines, and so much more. 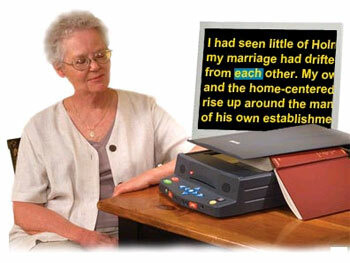 Using Optical Character Recognition (OCR) technology, the SARA works like a computer scanner that recognizes text, translates it into speech, then reads the text aloud. The advanced technology of the SARA does not get in the way of ease of use. For those with low vision and little to no computer experience, the SARA is the solution for reading small type. Right out of the box, you can place a book on the SARA, press a button to scan your reading material, and have it read back to you. Set the SARA to read continuously, or listen line by line or word by word. If you don’t understand a word, have it spelled out. Pause when you need to, rewind, and fast forward. The tactile buttons are large, colorful, and easy to reach and identify. The blind and deaf-blind have the additional option of built-in braille support. Just connect one of our portable braille displays — such as a Focus or PAC Mate™ Braille Display — to the USB port of the SARA, and any scanned document can be read in braille. When scanning documents with fainter type, you can set Contrast Adjustment to improve scanning and reading accuracy. Choose from reading voices that are the most natural-sounding and pleasant of any standalone scanning and reading system. The SARA features 36 male and female voices and 35 major languages plus 16 dialects.